Goodbye summer, it’s been emotional. All that sun, rain and scandal along with those examination results; let’s hope everyone managed to get some R&R. However, it’s over now and the reality of returning to school is starting to dawn on most of us, even though some of you will have been in school over the summer holidays and it feels like you never left. For some teachers it may be back to the same old routine, albeit with a new GCSE and A-level to plan for, while for others perhaps a fresh start in a new role…possibly in a new school or a different subject area. The fact is though, it’s a fresh start for all staff and students regardless of role and an opportunity to forget (but learn from) the events of previous years and approach this year with fresh eyes and a clean slate. Will I still be saying that in a few months or weeks? Very doubtful given I am taking a break from teaching but the ‘muscle memory’ is already kicking in; I wake at 6am panicking that I haven’t planned lessons for the day or prepared examination results data for the faculty meeting before I remember I don’t have to get up for another hour or so. For everyone still valiantly working in D&T education, here we are at the start of the school term and it’s probably the best chance you will have all year to leave any baggage at the door and start afresh. Now, how do we convey that same ideology to our students? After all, to coin a phrase, we are on a bus ride but who is on the bus...and more importantly, who is driving it?? The problem with depriving yourself of this chance to begin anew is that your first few weeks are going to be tough, presuming you haven’t already stressed yourself out over ‘what you might return to’ at work. So, some students did poorly in their mocks or didn’t make great progress in the Controlled Assessments, that doesn’t mean they will do the same this year. Examination results were a surprise; all you can do is read the feedback and try to address the recommendations providing you understand where it went wrong. 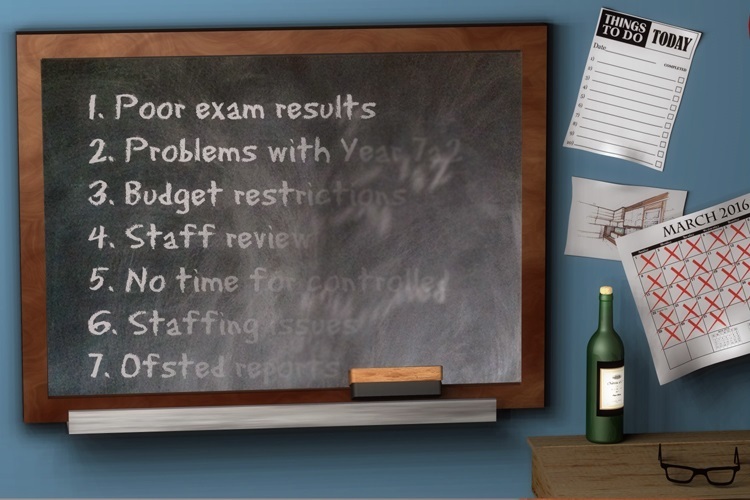 Had a bad Year 7 experience last year? This year’s cohort could be a bunch of little angels all eager to be the next world class designer. Absent staff, dwindling budgets, reduced contact time and more, these are all negatives that can put a damper on your attitude and enthusiasm at the very beginning of the term…and you know it won’t get any better as this long term plods on. For your sanity and the benefit of your pupil’s education, it’s vital that you treat this as a fresh start, learn from the mistakes made in the past and build upon the successes you have enjoyed. A quick look at social media and the newspapers is enough to depress anyone in education but you are there with a job to do and how that job develops over the next three terms is very much down to how you start the term. I am sure many of you have probably switched off by now thinking ‘who is this guy giving motivational advice; especially when he isn’t even teaching’ and I wouldn’t blame you at all but bear in mind that I have been exactly where you are now 22 times already. Furthermore, not being in a classroom teaching at the start of the term after all that time is more difficult than you might think so please do trust me when I say that I talk from experience. With that in mind, here are a few snippets of advice for your new term; I hope they are of some help, or consolation. 1. Don’t dwell on the examination results and certainly don’t torture yourself regarding where it might have gone wrong. Read the feedback, look at the data, make a plan and go for it! 3. Don’t let the negativity of others begin to affect your new found positivity. There are those who take great pleasure in sharing their concerns in the hope of finding a kindred spirit or a shoulder to cry on. Be supportive by all means but don’t be forced into ‘moaners corner’. 4. Everyone deserves a fresh start and a chance to improve, and that includes you. 5. There is always work at the call centre….or Aldi. Also I hear Gin works wonders. Ok, ignore number 5. If you are aiming to be positive this year but the fact is that everyone has their own approach to starting the new school year. The important thing to remember is that you deserve that fresh start and, in many ways, so do your students. Remember that here is just one year left of the old GCSE so, if you weren’t a fan of the current system, use that to provide you with the vigour to plan enthusiastically for the new reformed examinations from September 2017. For any of you who, like me, are starting afresh in a role outside of D&T teaching I wish you the best of luck but why on earth are you still here reading blogs? Get on with your new job and don’t look back. It’s a fresh start for you as well.